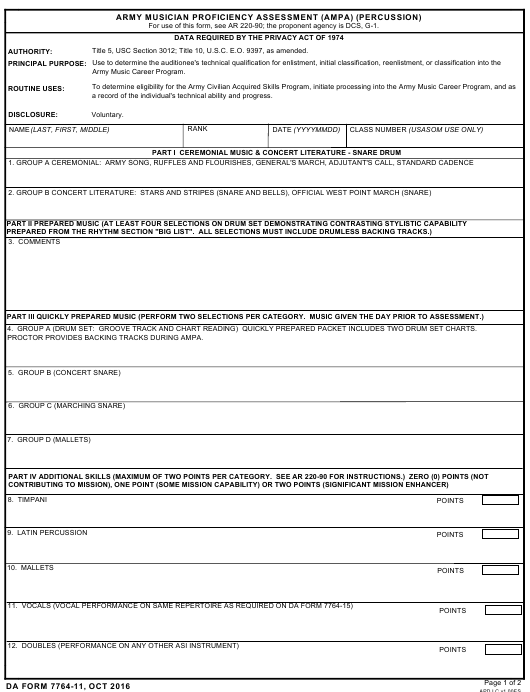 DA Form 7764-11 or the "Army Musician Proficiency Assessment (ampa) (percussion)" is a Department of the Army-issued form used by and within the United States Military. The form - often incorrectly referred to as the DD form 7764-11 - was last revised on October 1, 2016. Download an up-to-date fillable DA Form 7764-11 down below in PDF-format or look it up on the Army Publishing Directorate website. 4. GROUP A (DRUM SET: GROOVE TRACK AND CHART READING) QUICKLY PREPARED PACKET INCLUDES TWO DRUM SET CHARTS. PROCTOR PROVIDES BACKING TRACKS DURING AMPA.